4 Ways To Keep Your Teens Safe While You're Away | Calgary Alarm Inc.
Children aren’t always aware of the steps parents take to ensure their safety and well-being, so when you start to entrust them to take care of themselves and the home, things can go wrong. To help them adapt to their new responsibilities, you can give them the tools to help them learn how to be responsible adults. If you’ve scheduled your plumber or electrician to come by the house, you’ll know to expect their arrival and suspect unscheduled visits by maintenance workers. Your children may not be as familiar with these plans, so when a stranger dressed as a maintenance worker drops by, they may be intimidated into following instructions such as granting access to the house. You can prevent this situation by avoiding such appointments when you are away and letting your children know that they shouldn’t be expecting people or opening the door for them. Having a friend or family member drop by your home while you’re gone is important because they provide a second set of eyes to see if there’s something out of the ordinary going on. Furthermore, your children may be hesitant to reach out for help if they need assistance, so it’s important that the check-in happens in person not just over the phone. Neighbours are good candidates to keep an eye out — just make sure that you only tell people you trust about your absence because there’s also a risk with telling people that you’re away and your home is vulnerable. 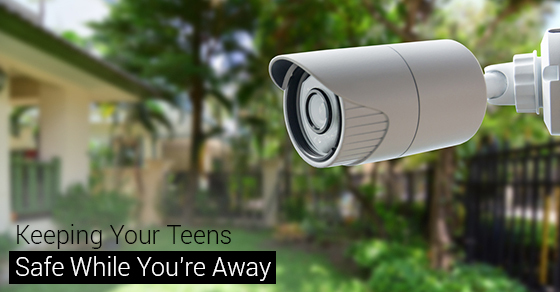 A security system automates vigilance, which keeps your children safe at night from burglars and other criminals. Security systems use lights to alert others when people come by, cameras to deter the bad guys, and alarms for monitoring and scaring intruders off. Security systems can give you and your children peace of mind so you can focus on your time away and your family can relax in the safety of their own home.